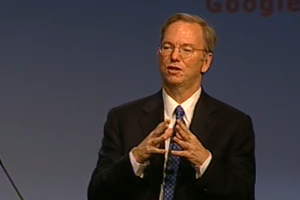 Eric Schmidt has gotten fairly used to irritating people over the years. Whether it’s technology rivals like Microsoft (s:MSFT) or captains of industry like Rupert Murdoch and Viacom’s Sumner Redstone, for many he’s become the itch that won’t go away. Now he’s stirred up feelings with another — less obvious — group: British teachers. Speaking at the Edinburgh TV Festival, an annual shindig for Britain’s television industry, the Google (s:GOOG) chairman lamented the state of computer education in the U.K. and said that its failure to give kids the tools to program is having a long-term impact on the country. He pinpointed the problem as a growing divergence between science and the arts — a cultural shift towards the humanities that has left engineering, science and mathematics languishing. Schools now focus their computer classes on practicalities like learning the ins and outs of Microsoft Office, rather than giving children the tools to master machines. The argument has received a strong response. For example This thread at the TES, a community for educators, vaccilates between anger and acceptance. “Did no-one else get a shiver of revulsion at a CEO of a multinational company like Google lecturing the educational community of this country on our curriculum?” asks one forum member. Not everyone was defensive, though. In The Observer, columnist John Naughton (himself an engineer) said children need to be given a “license to tinker”, with support from government officials. Meanwhile, a report from the Educating Programmers Summit suggests that answers are needed but that “any solutions for the UK’s education issues are going to have to come from within”. Of course, this argument is not entirely new. Fifty two years ago the famed British intellectual CP Snow outlined the problem of two divergent worlds of science and humanities — his so-called “Two Cultures” — that were failing to progress because they were not working in harmony. As a novelist and scientist, Snow believed there was a middle ground. Yet there has not been much progress since he called for a revolution. But this is not just a British problem. American media theorist Douglas Rushkoff has argued vociferously that schools in the U.S. face a similar dilemma. In his book Program Or Be Programmed, he says that if we do not understand how to control machines, they will end up controlling us. Writing on the Huffington Post last year, he called out the U.S. education system as a failure in much the same way as Schmidt. Amazingly, America – the birthplace of the Internet – is the only developed nation that does not teach programming in its public schools. Sure, some of our schools have elected to offer “computer” classes, but instead of teaching programming, these classes almost invariably teach programs: how to use Microsoft Office, Adobe Photoshop, or any of the other commercial software packages used in the average workplace. We teach our kids how to get jobs in today’s marketplace rather than how to innovate for tomorrow’s. Similarly, Jonathan Zittrain’s 2008 book The Future of the Internet — And How To Stop It voices concerns that the rising popularity of closed systems like the iPhone mean users are moving further and further away from a genuine understanding of computers. His argument is essentially about the difference between being a user and a consumer. The standard of computer teaching in America is much worse than Schmidt makes out, with public schools often bereft of any computer teaching. And the U.S. might have a stronger software culture thanks to Silicon Valley and some of the top colleges in the world, but if most kids aren’t getting the chance to learn programming skills perhaps the same decline that Britain has seen could be on the cards for America. The reality is that this is a problem for much of the West. There are efforts to try. Individual teachers can do a heroic job, and there are schemes like the U.K.’s Raspberry Pi, an open, low-cost computer for schools. I gave that project a hard time in the past, but at least it is attempting to answer these questions. The real concern must be whether anything we do now is simply too little, too late. Is it? These two objectives aren’t mutually exclusive, of course, and in fact I don’t think any child should be leaving school without a basic understanding of office productivity software. The problem with British IT classes, at least ten years ago when I was doing them, was that this was all we learned. In fact, I wouldn’t mind seeing the British government scrap its current IT curriculum altogether and have kids take a combination of the CompTIA A+ and Microsoft Office Specialist certifications at sixteen, and then have anyone interested in an IT career pick a selection of more advanced qualifications to study until graduation. He is right. Not teaching programming to school students in today’s world is like not teaching them basic Math or Physics. Look at what engineers are paid in these countries, and then you’ll know why no one wants to be an engineer. people’s lives, there should not be any compromise nor any dubious or obscure points left. This article raises many good points. I am of the opinion that even simply teaching the basics of HTML would not only be useful, but could spark interest in students to branch out to other languages if they were interested.